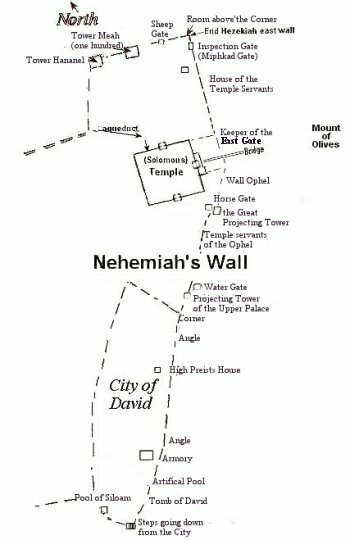 Nehemiah's wall gives us some important information that helps identify where the Temple was NOT located. According to scripture Nehemiah did not rebuild any of the Temple walls. He only rebuilt the City walls, which means that the lower courses of stones in the east wall of the Mount were part of that city wall that Nehemiah rebuilt. The ruins of the oldest gate in the eastern wall still remain beneath the Muslim East Gate that we see today. It was NOT the east gate of Solomon's Temple. Leen Ritmeyer, after finding two stones of what he believes to be part of the old Hezekiah wall (700 BC) indicates that the Hasmonean wall joins to the Hezekiah wall (in blue). This means there would also be a joint where these two walls meet together. 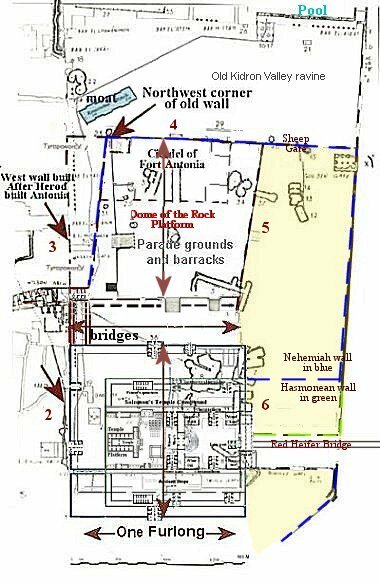 The Hezekiah/ Nehemiah wall extended from that supposed joint and ends just beyond the Muslim east gate where it took a 90 degree turn and crossed the Temple Mount reaching as far as the edge of the Tyropeon Valley. Even though I agree with Dr Ritmeyer about Hezekiah's wall beginning with these two stones, I disagree that it was a wall of the Temple. Remember Nehemiah rebuilt the city wall only. He did not rebuild any of the outer walls of the Temple. Leen Ritmeyer claims this old Hezekiah city wall was the east wall of the Temple compound and so places the location of the Temple where the Dome of the Rock now stands. 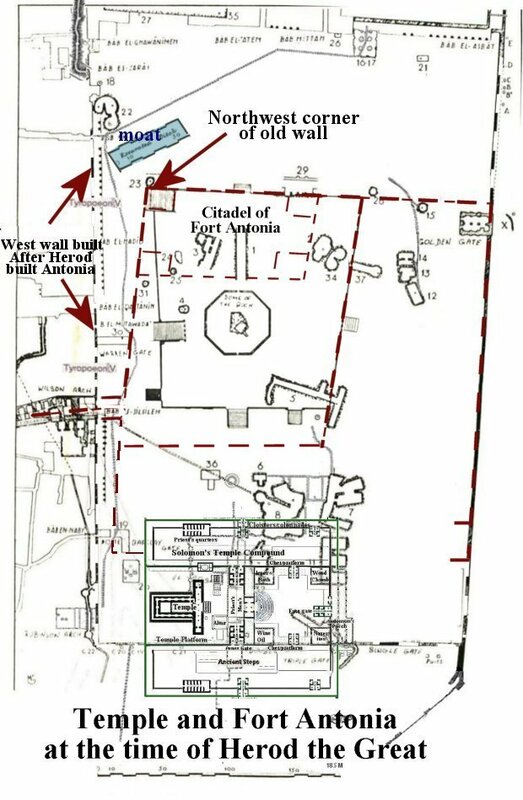 Notice in the diagram that the Muslim gate is in the uppermost northern position in Hezekiah's wall. Also the Hasmonean (165 BC) (in yellow) claimed more of the steep east hill by extending the old wall further toward the south. It is interesting to trace the changes in the area from the time that Nehemiah rebuilt the city wall, all the way up to when Josephus describes Fort Antonia. The wall described by Nehemiah had two towers on it's north wall, the Towers Meah and Hananeel. These towers protected the Temple from a northern attack. and was renamed the Tower Baris. It was rectangular and possessed several high towers. The Baris was connected to the Temple by an underground passageway. The Baris was then besieged by Pompey the Great in 63 BC. Under Herod the Great, the Baris underwent extensive reconstruction, and he named it Fort Antonia in honor of Mark Anthony. Fort Antonia, just as the Baris and the Meah before it, was located on the old north wall that Nehemiah rebuilt. It overlooked a moat on its north side. This topographical map shows there was a natural land bridge between Fort Antonia and the lower hill to its north, called Bezetha. The moat was 200 feet long, and to the east of it was a ravine called the old Kidron Valley. The moat was cut for the purpose of separating the two hills, and making it impossible for catapults to be set up near the north wall of the Fortress, for lack of flat land. However attacking armies would just fill in the moat with debris and create a flat surface and break down the north wall taking the fortress. From there they could take the Temple. According to Josephus this moat separated Fort Antonia from the hill to its north. It is my belief that the walls of Fort Antonia were at a Northwest angle to the Temple. 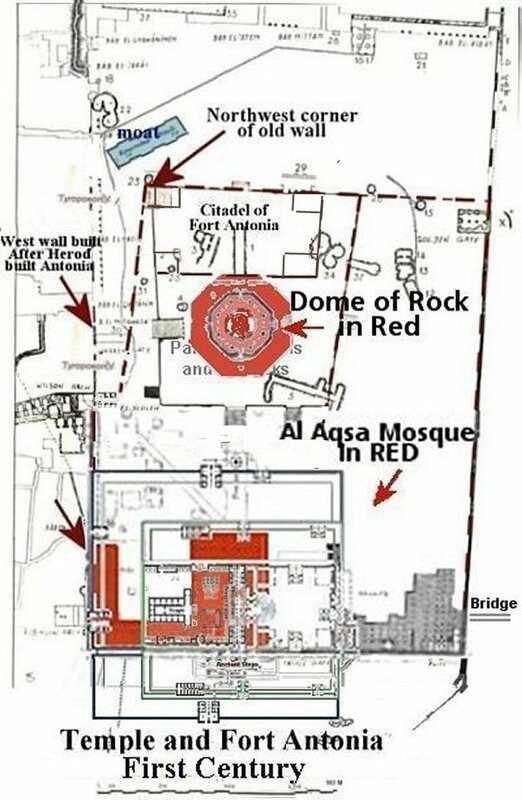 There is a step at the northwest corner of the Dome of the Rock platform. The bottom step is not a step at all. It is in fact a very old wall set at an angle. 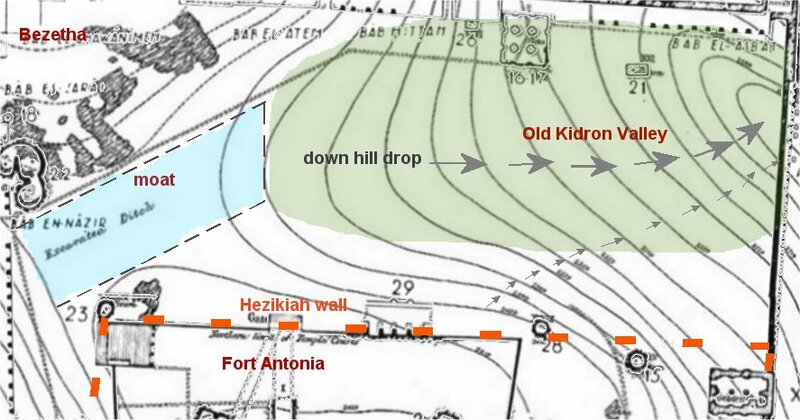 The red line in the map shows the old west wall following that same angle as it bends southward, forming the old northwest corner of Fort Antonia. Since the discovery of this wall the Muslims have covered it up but it was well documented beforehand. Recently coins from the 1st century were found under the west wall of the Temple Mount that we see today. This means that Herod the Great did not build the southern portion of the west wall, including the bridge called Robinson's Arch. However this bridge was one of the west gates Josephus claimed entered directly into the 600 x 600 foot Temple complex. We also know that the walls were not completed until 66 AD and yet Josephus seems to attribute it all to Herod the Great, who died in 4 BC, so this work was most likely completed under Herod Agrippa I and Herod Agrippa II, of the "House of Herod". Below would have been Fort Antonia and the Temple in the first century, after the work extending the temple courts was complete. Josephus describes Antonia as a tower (fortress) with four towers and around it were other towers. In other words a fortress/citadel within a fortress. Two colonnades on the west and on the north connected Fort Antonia to the Temple. According to Josephus the Temple and Fort Antonia, together, were six furlong around. 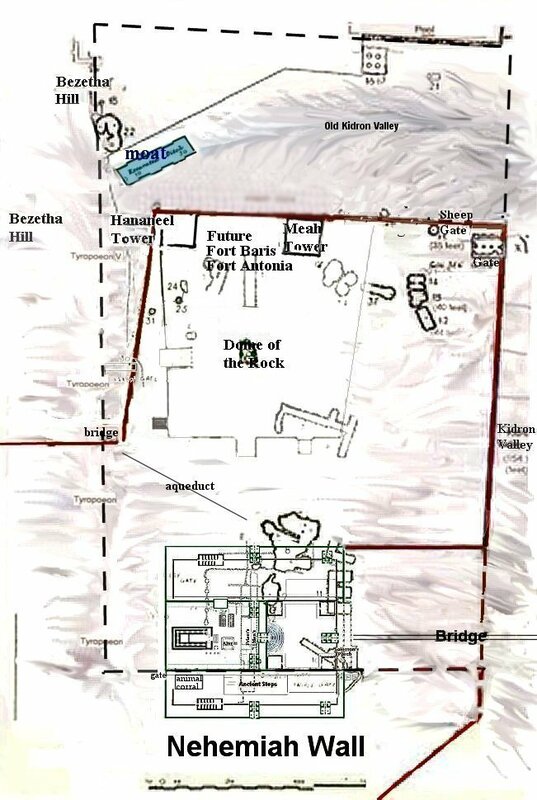 (War of Jews Book 5, 5) Meaning the Temple and Fort Antonia were each 600 x 600 feet. This tells us that Fort Antonia only took up a small portion of the Temple mount we see today. 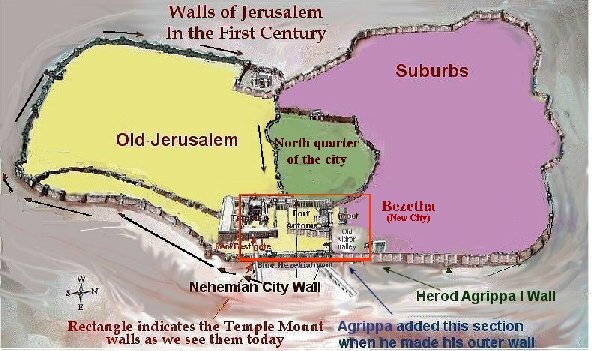 The city walls during the time of Nehemiah (yellow). Herod rebuilt this wall and also built a wall around the north quarter of the city (in green). A third city wall included the city of Bezetha (purple). This third wall connected to the old Hezekiah city wall on the east. There wasn't a wall between Bezetha hill and the moat. .......The second wall took its beginning from that gate which they called "Gennath," which belonged to the first wall; it only encompassed the northern quarter of the city, and reached as far as the tower Antonia. The beginning of the third wall was at the tower Hippicus,............It was Agrippa who encompassed the parts added to the old city with this wall, which had been all naked before; for as the city grew more populous, it gradually crept beyond its old limits, and those parts of it that stood northward of the temple, and joined that hill to the city, made it considerably larger, and occasioned that hill, which is in number the fourth, and is called "Bezetha," to be inhabited also.